The first ever boccia open competition held in the Borders has been hailed as a great success. The open competition held at the Queens Centre in Galashiels on Saturday 29 August attracted 40 entrants from all over the region with additional competitors travelling from as far afield as Glasgow and Edinburgh. Boccia is a Paralympic sport closely related to bowls but which is played by competitors with a physical or learning disability from a sitting position. The game is growing in popularity in the Borders with over 45 people playing every week in groups based in Eyemouth, Galashiels, Hawick and Peebles. There are also plans to set up new groups in Kelso and Duns. Cheered on by an enthusiastic crowd of supporters, 70 group matches were played out before the elimination stages. In the finals, Faizan Mustafa (Edinburgh Flyers) won the learning disability section while Adam Stafford (Edinburgh) overcame Eyemouth Pirates coach, Neil McMurdo in the final of the disability section. 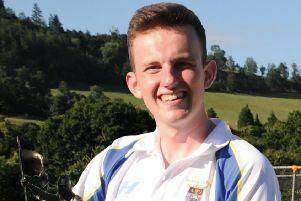 There was an all-Borders play-off in the Assistive Device finals where Hawick’s Lewis Teckham beat another Eyemouth Pirates player, Douglas Boyd in a thrilling contest. The Borders boccia open competition will now become an annual event and a key feature of the Scottish Disability Sport and Borders Sports & Leisure Trust event calendars. A Borders Boccia Club has been established with support from the Council and NHS Borders Joint Learning Disability Service, Borders Sports & Leisure Trust, the Scottish Borders Disability Sports Group and Scottish Disability Sport. The club is working hard to attract grant funding to support the continued development of the sport in the Borders with the aim of giving people who have a disability the opportunity to participate in an enjoyable and competitive activity.